From United States v. Oliver L. North, Office of the Independent Counsel (OIC) Papers, National Archives & Records Administration, College Park, Maryland. Washington D.C., 26 February 2004 - Diaries, e-mail, and memos of Iran-contra figure Oliver North, posted today on the Web by the National Security Archive, directly contradict his criticisms yesterday of Sen. John Kerry's 1988 Senate Foreign Relations subcommittee report on the ways that covert support for the Nicaraguan contras in the 1980s undermined the U.S. war on drugs. Mr. North claimed to talk show hosts Hannity & Colmes that the Kerry report was "wrong," that Sen. Kerry "makes this stuff up and then he can't justify it," and that "The fact is nobody in the government of the United States, going all the way back to the earliest days of this under Jimmy Carter, ever had anything to do with running drugs to support the Nicaraguan resistance. Nobody in the government of the United States. I will stand on that to my grave." The Kerry subcommittee did not report that U.S. government officials ran drugs, but rather, that Mr. North, then on the National Security Council staff at the White House, and other senior officials created a privatized contra network that attracted drug traffickers looking for cover for their operations, then turned a blind eye to repeated reports of drug smuggling related to the contras, and actively worked with known drug smugglers such as Panamanian dictator Manuel Noriega to assist the contras. The report cited former Drug Enforcement Administration head John Lawn testifying that Mr. North himself had prematurely leaked a DEA undercover operation, jeopardizing agents' lives, for political advantage in an upcoming Congressional vote on aid to the contras (p.121). Also in the posting is Peter Kornbluh's detailed critique - the January/February 1997 cover story in the Columbia Journalism Review - of news coverage of the contra-drug allegations, including the controversial San Jose Mercury News series. 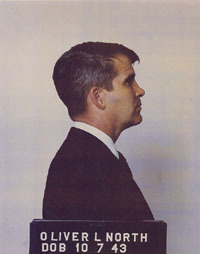 The National Security Archive obtained the hand-written notebooks of Oliver North, the National Security Council aide who helped run the contra war and other Reagan administration covert operations, through a Freedom of Information Act lawsuit filed in 1989 with Public Citizen Litigation Group. The notebooks, as well as declassified memos sent to North, record that North was repeatedly informed of contra ties to drug trafficking. In his entry for August 9, 1985, North summarizes a meeting with Robert Owen ("Rob"), his liaison with the contras. They discuss a plane used by Mario Calero, brother of Adolfo Calero, head of the FDN, to transport supplies from New Orleans to contras in Honduras. North writes: "Honduran DC-6 which is being used for runs out of New Orleans is probably being used for drug runs into U.S." As Lorraine Adams reported in the October 22, 1994 Washington Post, there are no records that corroborate North's later assertion that he passed this intelligence on drug trafficking to the U.S. Drug Enforcement Administration. In a July 12, 1985 entry, North noted a call from retired Air Force general Richard Secord in which the two discussed a Honduran arms warehouse from which the contras planned to purchase weapons. (The contras did eventually buy the arms, using money the Reagan administration secretly raised from Saudi Arabia.) According to the notebook, Secord told North that "14 M to finance [the arms in the warehouse] came from drugs." An April 1, 1985 memo from Robert Owen (code-name: "T.C." for "The Courier") to Oliver North (code-name: "The Hammer") describes contra operations on the Southern Front. Owen tells North that FDN leader Adolfo Calero (code-name: "Sparkplug") has picked a new Southern Front commander, one of the former captains to Eden Pastora who has been paid to defect to the FDN. Owen reports that the officials in the new Southern Front FDN units include "people who are questionable because of past indiscretions," such as José Robelo, who is believed to have "potential involvement with drug running" and Sebastian Gonzalez, who is "now involved in drug running out of Panama." On February 10, 1986, Owen ("TC") wrote North (this time as "BG," for "Blood and Guts") regarding a plane being used to carry "humanitarian aid" to the contras that was previously used to transport drugs. The plane belongs to the Miami-based company Vortex, which is run by Michael Palmer, one of the largest marijuana traffickers in the United States. Despite Palmer's long history of drug smuggling, which would soon lead to a Michigan indictment on drug charges, Palmer receives over $300,000.00 from the Nicaraguan Humanitarian Aid Office (NHAO) -- an office overseen by Oliver North, Assistant Secretary of State for Inter-American Affairs Elliott Abrams, and CIA officer Alan Fiers -- to ferry supplies to the contras. State Department contracts from February 1986 detail Palmer's work to transport material to the contras on behalf of the NHAO. In June, 1986, the New York Times published articles detailing years of Panamanian leader Manuel Noriega's collaboration with Colombian drug traffickers. Reporter Seymour Hersh wrote that Noriega "is extensively involved in illicit money laundering and drug activities," and that an unnamed White House official "said the most significant drug running in Panama was being directed by General Noriega." In August, Noriega, a long-standing U.S. intelligence asset, sent an emissary to Washington to seek assistance from the Reagan administration in rehabilitating his drug-stained reputation. Oliver North, who met with Noriega's representative, described the meeting in an August 23, 1986 e-mail message to Reagan national security advisor John Poindexter. "You will recall that over the years Manuel Noriega in Panama and I have developed a fairly good relationship," North writes before explaining Noriega's proposal. If U.S. officials can "help clean up his image" and lift the ban on arms sales to the Panamanian Defense Force, Noriega will "'take care of' the Sandinista leadership for us." North tells Poindexter that Noriega can assist with sabotage against the Sandinistas, and suggests paying Noriega a million dollars -- from "Project Democracy" funds raised from the sale of U.S. arms to Iran -- for the Panamanian leader's help in destroying Nicaraguan economic installations. The same day Poindexter responds with an e-mail message authorizing North to meet secretly with Noriega. "I have nothing against him other than his illegal activities," Poindexter writes. On the following day, August 24, North's notebook records a meeting with CIA official Duane "Dewey" Clarridge on Noriega's overture. They decided, according to this entry, to "send word back to Noriega to meet in Europe or Israel." The CIA's Alan Fiers later recalls North's involvement with the Noriega sabotage proposal. In testimony at the 1992 trial of former CIA official Clair George, Fiers describes North's plan as it was discussed at a meeting of the Reagan administration's Restricted Interagency Group: "[North] made a very strong suggestion that . . . there needed to be a resistance presence in the western part of Nicaragua, where the resistance did not operate. And he said, 'I can arrange to have General Noriega execute some insurgent -- some operations there -- sabotage operations in that area. It will cost us about $1 million. Do we want to do it?' And there was significant silence at the table. And then I recall I said, 'No. We don't want to do that.'" Senior officials ignored Fiers' opinion. On September 20, North informed Poindexter via e-mail that "Noriega wants to meet me in London" and that both Elliott Abrams and Secretary of State George Shultz support the initiative. Two days later, Poindexter authorized the North/Noriega meeting. Reagan administration officials interceded on behalf of José Bueso Rosa, a Honduran general who was heavily involved with the CIA's contra operations and faced trial for his role in a massive drug shipment to the United States. In 1984 Bueso and co-conspirators hatched a plan to assassinate Honduran President Roberto Suazo Córdoba; the plot was to be financed with a $40 million cocaine shipment to the United States, which the FBI intercepted in Florida. 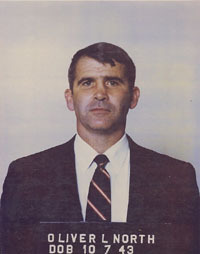 Declassified e-mail messages indicate that Oliver North led the behind-the-scenes effort to seek leniency for Bueso . The messages record the efforts of U.S. officials to "cabal quietly" to get Bueso off the hook, be it by "pardon, clemency, deportation, [or] reduced sentence." Eventually they succeeded in getting Bueso a short sentence in "Club Fed," a white collar prison in Florida. The Kerry Committee report reviewed the case, and noted that the man Reagan officials aided was involved in a conspiracy that the Justice Department deemed the "most significant case of narco-terrorism yet discovered." The text below is taken from page 146 of the Drugs, Law Enforcement and Foreign Policy report prepared by the Senate Subcommittee on Narcotics, Terrorism and International Operations ("Kerry Committee"). Click on the links to view the relevant passages from Oliver North's notebooks. Numerous other entries contain references to individuals or events whoch Subcommittee staff has determined have relevance to narcotics, terrorism, or international operations, but whose ambiguities cannot be resolved without the production of the deleted materials by North and his attorneys.